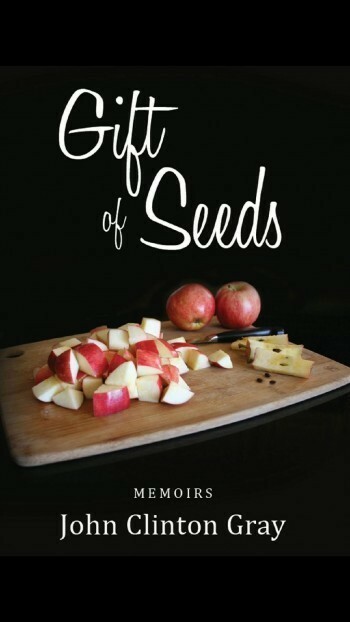 The following story and recipe are from John Clinton Gray's wonderful collection of stories called Gift of Seeds. And by the way, we've tried this recipe and it's absolutely delicious. To enjoy more of John's stories, you can order his book from Amazon. This Alice is not a young lady chasing rabbits. It’s a little fish, in Italian, and a-l-i-c-e is how it’s spelled in Italian. Pronouncing it, however, is another matter. A in Italian is pronounced ah, as in father. L sounds just like the L we know and love. I is pronounced like an English long e, as in he, or be. C before e sounds like ch, as in much and such. Put the sounds together and we have Ah LEECH, with accent on the leech. Now we’re talking Italian. If a pasta dish made with these salty, tasty, oily little fish is on the menu of a restaurant in Italy or in a real Italian neighborhood, it might show up as alice or maybe as acciughe. I have some difficulty pronouncing the latter properly, but I can say ahLeech and I’ve never been let down. Even if alice is not on the menu, a bona fide Italian place will make it for you. However, it’s really more of an Italian home meal than restaurant fare, a recipe so simple that Italian mothers teach culinary-challenged sons to make it so if they’re ever on their own they won’t go hungry. Think of it as Italian mac and cheese. The first time I had alice was with Raffaele, a real born-in-Italy Italian. He had served in the Italian navy, assigned to a merchant ship. At 21, Raffaele jumped ship in New York, met, wooed, and married Louise, an Italian American Brooklynite, and became Ralph. He worked in the Garment District in Manhattan for thirty-seven years. They raised three lovely daughters, the youngest a bit spoiled, and Ralph didn’t cook much because Louise was such a good one. But now and then, on a Saturday, he’d make a midday meal for some men friends. After he retired and they moved west, Ralph had more time to enjoy himself. His men’s lunches became famous in our California neighborhood. I felt honored to be invited. There was a ritual to the events. Louise would always lay out a wonderful antipasto and leave before the guys arrived. Ralph’s part of the menu was always the same: red wine, bread, and alice. He didn’t make, and we didn’t want, anything else. Fahgetaboutit. Olive oil, garlic, capers, a few pine nuts if you have them, and alice. That’s it. Sauté slowly until everything blends together into an intense paste drenched in golden oil. Spoon a little over each dish of al dente pasta, and serve. I always brought wine, but Ralph preferred his own from a jug beside his chair. “Waddeyathink?” Ralph asked the first time, eyes sparkling, a grin starting. It was truly the most delicious pasta I’d ever had, and the tangled tastes were new in my mouth---salty, savory, sharp, sensual, all having a party. Ralph recited the short list. He said “anchovy” in English. 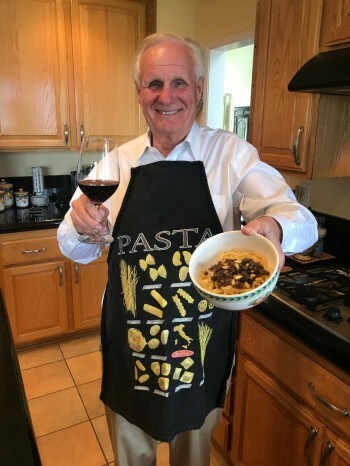 An Italian mom didn’t teach me to cook alice in my youth, but years later, Ralph initiated me as an honorary member of the non-secret society. I’ve since prepared it many times, and I always smile at the unexpected delight of first-time samplers, just as Ralph enjoyed mine. Pamela and I visited Ralph and Louise in the care facility they moved to when their declining health required it. 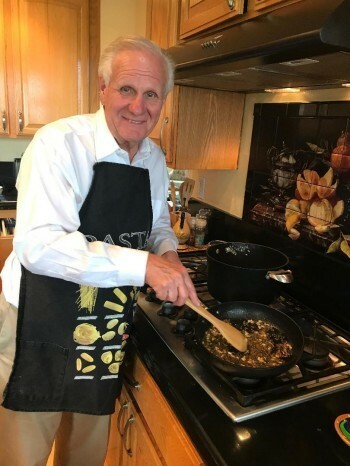 Ralph’s dementia often left him sweetly forgetful of the day’s events and even current conversations, but he always remembered his alice lunches and the friendships, warmth, and wine. At the sound of his given name Ralph’s eyes misted and he was a boy again, running with his amici on the slopes of Vesubio. So, you heard the Alice story and you want a recipe? Fahgetaboutit. I can only tell you what Ralph taught me. But first we gotta talk. Some people think they don’t like anchovies. As Ralph would say, "Waddeya, crazy? You like Caesar salad?" The tangy, salty, mildly fishy taste in the dressing is anchovy. So, unless Caesar salad gives you hives or something, try Ralph’s alice. If you really are allergic to anchovies, stick to chicken. Ingredients: olive oil (olio d’oliva), garlic (aglio), capers (capperi), a few pine nuts (pinoli) if you have them, anchovies (alice), and linguini (linguine). That’s it. How many are coming over? Okay, so you’re making for four. Get ready. Da whole thing only takes fifteen, twenty minutes. Peel da garlics. Maybe six or eight cloves should be good. More if they’re small, less if they’re big. Squeeze ’em wit a garlic press. Nice little pile o’ minced garlic. Put ’em aside and tell ’em to wait. Open the anchovies. Open the jar of capers. Open the pine nuts. Start heating some olive oil in a pan—nothing fancy, just a little frying pan. I can’t tell you how many spoons of oil, just a glug or two, not too much. Warm it up. Toss in the garlic. Spread it flat in the oil. Careful not to use too much oil; you don’t wanna drown the garlic. And low heat! You don’t wanna deep-fry anything. Go slow. And get da pasta water on to boil. Add salt. Not much. A pinch. Okay. When the water is boiling, put da spaghettis in. Stir now and then. (Ralph liked linguini, but more often than not he still called it spaghetti. If you’re doing this Ralph’s way, you’re gonna use linguinis and call them spaghettis.) If you’re cooking the dry stuff from a box, cook the whole box except for the cardboard. If you’re using fresh pasta, you’re on your own. Stick to simple. Okay. The garlic is starting to look happy in the oil, kinda dancing around. Remember, low heat! Don’t let it brown. Now add the unrinsed capers—more of them than you think, and no extra liquid from the jar, ya hear? Throw in the pine nuts—a little handful. They’re pricey, but get real pinoli, not nuts from the other side of the world. Now the alice: one full tin, oil and all. If you’re brave, make it two tins. Live a little. Sauté (Ralph would say cook it) slowly, stirring often, until everything blends together into an intense paste. Check da spaghettis. Al Dente is not a guy Ralph grew up with back in Naples. It’s how far you cook da spaghettis. Nobody likes mush. Your tooth will let you know when the pasta’s al dente. Fish a piece out of the water and bite it with your front teeth. You can tell when it’s just cooked through but still has body. Your tooth knows. That’s what al dente means. When da spaghettis are ready, dump ’em in a strainer in the sink. Don’t rinse ’em—that just cools ’em off. Still wit me? We’re almost there. Remember I said not to use too much olive oil? Okay, that was to cook in. Now that your alice is made, you gotta make sure you have enough sauce for everybody, so add another glug of olive oil to stretch it. In a minute it will warm up in the pan. Stir a little. Perfect. For the final step you gotta move fast, so listen up. You have one of those plastic spaghetti-grabbers, right? Put one grab of pasta each in four soup bowls, and quickly plop two or three tablespoons of the sauce over the middle of each little mound of linguini. Serve now. Your guests will know enough to stir their linguini a little so it all gets coated. Italians, honorary Italians, and ordinary people who have seen "The Godfather" five or more times will need both a soup spoon and a fork to eat your fabulous dish. If you don’t know what I mean, fahgetaboutit. Red wine. Ya gotta have it. At Ralph’s lunches you could bring an $80 Barbera but he’d still, and genuinely, prefer his jug Chianti. He said it’s what he grew up with, and it tasted right. Offer real Parmesan cheese, grated or shaved—definitely not that processed stuff that starts with a “K.” Parmesan perfectly complements the sharp alice flavors. I’ve made alice a hundred times, probably more, and never exactly the same way twice. You might have noticed this recipe is a little loose. That’s how ya gotta be. Relax. Once I was low on capers and minced some lemon rind to supplement. Our guests didn’t know the difference—and I never told Ralph. Not that it would have mattered. For him, it was always the people. The food was second, an excuse. That’s a recipe for life.